Water storage capacity is an important tool in California’s water system for capturing lower-value water for higher-value uses later. Such storage aids water supply, flood protection, hydropower, and recreational uses and helps regulate downstream water quality and supply cold water flows for fish. California has about 42 million acre-feet(maf) of surface reservoir storage capacity and much more storage capacity in underground aquifers (150 million to 1.45 billion acre-feet, depending on how you count it). Seasonal water storage: In normal years, about 8-14 million acre-ft of water is stored in the wet season and used in the dry season. This compares to roughly 34 maf/yr of average net agricultural and urban water use. Human water use is highest in California’s dry summer, so crops and landscapes must be watered from stored winter and spring flows. Roughly 5-8 maf is held in surface reservoirs and 3-6 maf is held in groundwater basins. Drought water storage: Water also is stored from wet years for use in dry years. The amount stored varies with the drought’s intensity and length. Stored surface water is mostly used in the initial drought years, while stored groundwater plays a larger role in prolonged droughts. I’m unaware of anyone with data on statewide drought storage use, but from our modeling results, about 35-43 maf is ideally carried over from wet to dry years for droughts lasting 3-6 years. Of this total, some 15-18 maf is held in surface reservoirs and 20-25 maf in aquifers. 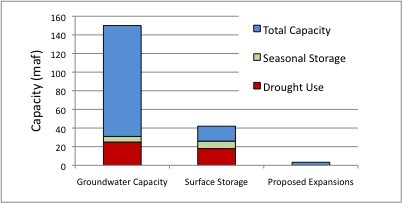 Figure 1: Statewide capacities and approximate use of surface and groundwater storage, and proposed surface storage expansion. Should we pay for more water storage? All combined, proposed state expansions of surface storage facilities would add less than 3.3 maf of new capacity (Sites: 1.3-1.8 maf, Temperance Flat: 0.43-1.3 maf, Los Vaqueros: 60-175 taf). This is not much relative to existing capacities (Figure 1). In evaluating cost and effectiveness of such facilities, size, connections, and location matter, among other things. Storage effectiveness decreases with size: Reservoirs only store water, they cannot create it. No reservoir can reliably deliver more than the reservoir’s average annual inflow (minus evaporation). Enlarging a reservoir always increases water deliveries by a smaller proportion (Hazen 1914). Similarly for flood management, larger reservoirs provide more control, but with decreasing incremental effectiveness. 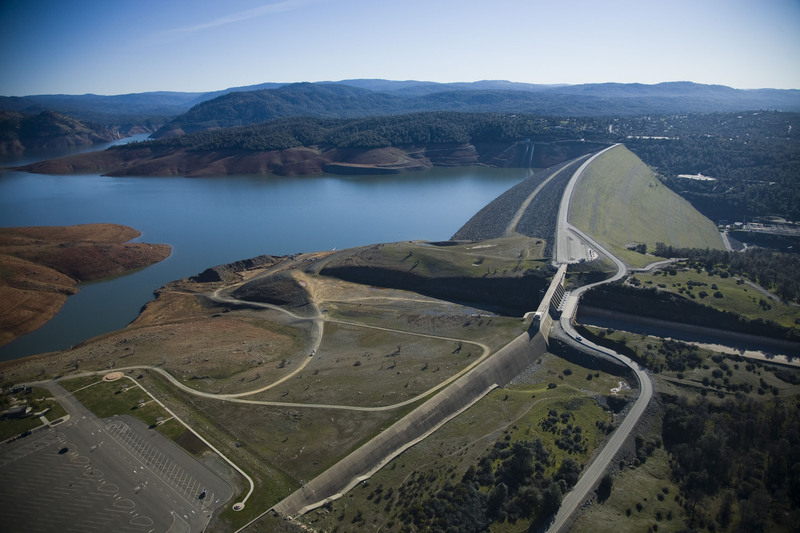 Most easy, cheap, and effective reservoir locations in California already have reservoirs. Flexibility varies with storage type: Traditional surface reservoirs (on-stream storage behind a dammed river) fill directly with stream flow, and can empty as fast as gravity and its outlet structure allow. Today most new surface storage is off-stream storage (e.g. Sites, Los Vaqueros), which fills more slowly with pumps, increasing costs and reducing its ability to manage floods. Groundwater storage usually fills slowly by infiltration from the surface, making aquifers less directly useful for managing floods. Groundwater also must be pumped out, also at a limited pace and at some cost. Such limitations on filling and withdrawing water from storage are important considerations for system operation and performance. Location, location, location: The value of storage depends on its location in a network. Storage is most valuable when releases can be brought to use. If Delta conveyance is “broken”, north of Delta storage (e.g., Sites reservoir) becomes less valuable. 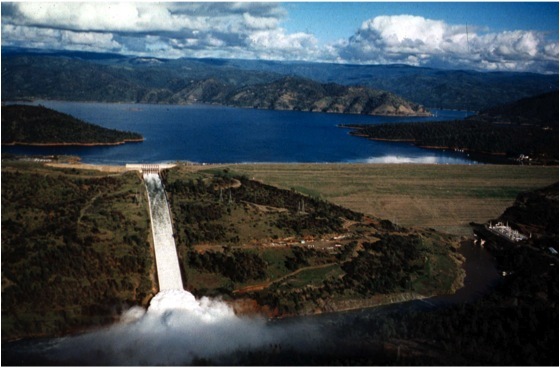 Lake Oroville Dam, February 2009. Note the distance of the water from the spill way gates (middle right). Storage should be examined and used as part of a system. Thinking about new storage investments should consider the following factors. Storage investments should be a business decision. Water managers will always prefer more storage capacity, especially if it is free. But surface storage has substantial costs (financial, environmental, legal), and political controversy. Is more storage at a particular location a good system investment, relative to other uses of scarce money (and political attention)? Storage has somewhat different roles from the past. 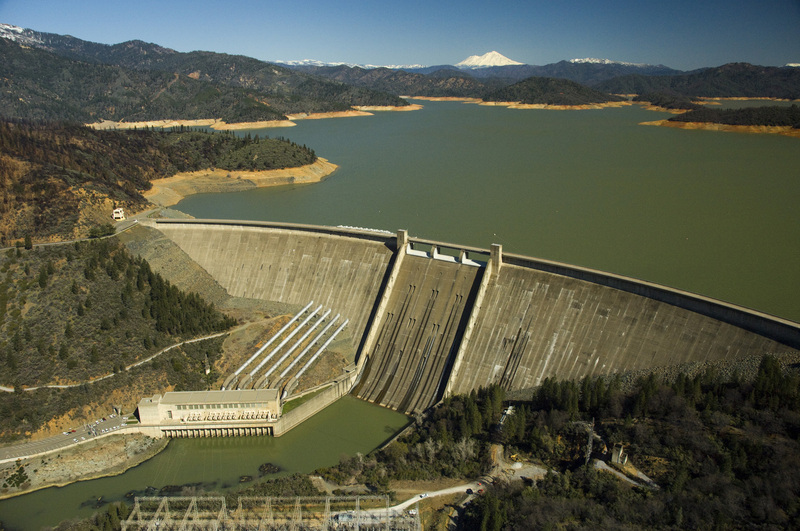 Water markets, water conservation, water reuse, conjunctive use of ground and surface waters, and other innovations change how we can best use storage assets. Water demands also have grown and become more diverse. Water markets and conjunctive use, in particular, increase the value of coordinated operation. Expanding storage will be less effective without other, perhaps greater, changes in water use and management. Better management can improve the value of storage. Coordinated operation of storage and other water management activities can improve overall performance by making more effective use of existing or new storage. In the 1970s, vast expansions of storage were proposed on the Potomac River to supply the Washington, DC area. A university reoperation study found that adding only one small reservoir would enable existing reservoirs to handle expected growth in demands (Palmer et al. 1982). Increases in conjunctive management of water surface and groundwater storage in California since the 1980s have already greatly improved system performance. There remains potential for improvement. Climate change might affect the value of storage. Climate warming is reducing the ability of California’s snowpack to store water seasonally. Fortunately, downstream reservoirs on many streams are already large compared to seasonal changes in streamflows and flood peaks. Model results show that with the right management, climate warming might be inconvenient, not catastrophic, for most water uses. Warming will likely bring difficulties in managing stream temperatures for salmon. Larger reservoirs or changed operations might better preserve cold water for fish. Reduced precipitation could pose great challenges for water supplies and ecosystems. But larger reservoirs might not be of much help; with a much drier climate, there could be too little water to fill even existing storage capacity. Some places seem more promising for new storage than others. From modeling work and observations, additional storage seems most promising at or above Folsom reservoir (for floods, perhaps as a dry dam), Los Vaqueros (for improving delivered water quality), Kaweah and Tule river storage mostly (to reduce operating costs), and improved groundwater recharge and storage in metropolitan areas, the Sacramento Valley, and elsewhere. Other places might prove promising, especially if investments and management are coordinated systemwide for several human and environmental purposes. A system-wide business case is needed for such large investments. Few expansion proposals will pass this test. Most storage expansion costs must be borne locally. Federal and state budget problems mean that most future water infrastructure will need to be financed by local beneficiaries. Even if the currently proposed water bond is passed, less than 50% of storage costs could be covered by state general revenues. This places local agencies and users in the driver’s seat, and seems to render most state discussions moot until local contributors become apparent. However, infrastructure of statewide importance is unlikely to emerge without an ability of local agencies to trust in state or regional planning, policy, and contracting efforts. Water storage is important for most human and environmental objectives, but has large costs and must fit within a large and diverse water and environmental system. We should be thoughtful and creative in thinking about storage or other major investments, and ultimately cold and calculating about their value. Buck, C.R., J. Medellín-Azuara, J.R. Lund, and K. Madani, “Adapting California’s water system to warm vs. warm-dry climates,” Climatic Change, in press. Harou, J.J., J. Medellin-Azuara, T. Zhu, S.K. Tanaka, J.R. Lund, S. Stine, M.A. Olivares, and M.W. Jenkins, “Economic consequences of optimized water management for a prolonged, severe drought in California,” Water Resources Research, doi:10.1029/2008WR007681, Vol. 46, 2010. Hazen, A. (1914), Storage to be provided in impounding reservoirs for municipal water supply,” Transactions of the American Association of Civil Engineers, Vol. 77, pp. 1539-1669. Lund, J.R., R.E. Howitt, M.W. Jenkins, T. Zhu, S. Tanaka, M. Pulido, M. Tauber, R. Ritzema, I. Ferriera, “Climate Warming and California’s Water Future,” Center for Environmental and Water Resources Engineering Report No. 03-1, Dept. of Civil and Environmental Engineering, University of California, Davis, CA, http://cee.engr.ucdavis.edu/faculty/lund/CALVIN/, 2003. Palmer, R.N., J.A. Smith, J.L. Cohon, and C.S. ReVelle (1982) Reservoir management in the Potomac River basin, Journal of Water Resources Planning and Management Division, ASCE, Vol. 108, No. 1, 47-66. This entry was posted in Uncategorized and tagged drought, Jay Lund, water storage. Bookmark the permalink.